Hast Imam is literally translated into “the first saint.” This stunning holy complex lying in the heart of Tashkent houses three eminent mausoleums: the Barak-Khan madrasah, Tilla-Sheikh mosque, and the mausoleum of the saint Abu Bakr Kaffal Shashi. Hast Imam is the sanctuary of approximately 20,000 books and 3,000 manuscripts brought from different parts of the world. In fact, one of the most famous Qurans in the world, the Othman Quran, is well preserved in this solemn complex. On Fridays, thousands of Muslims from different parts of Uzbekistan flock to Hast Imam to worship. As early as five o’clock in the morning, people are already coming in to pray before they begin their workday. Fergana Valley is the largest desert basin found between the Pamir and Tian Shan mountains. It is fed by two rivers, the Kara Darya (“black river”) and the Naryn, which flows from the Tian Shan. These two rivers eventually merge to form one of the largest rivers in Central Asia, the Syr Darya. The valley is a must-visit for people looking forward to understanding Uzbek farming. A lot of produce – fruits, grains, vegetables, and the area’s major product, cotton – come from this valley. Visitors are welcome to visit Fergana Valley’s vast cotton fields and fruit orchards. Other places of interest in the valley include silk shops and colorful bazaars. Samarkand, a UNESCO World Heritage site whose name literally means “rock town” or “stone fort,” is perhaps the most renowned city of the modern Uzbekistan. This majestic city lies at the center of Silk Road, the trade route where China met the West. Here in the city of Samarkand, you will behold an amazing collection of ancient architectural structures. The Registan, which means “sandy place,” is another must-see destination. 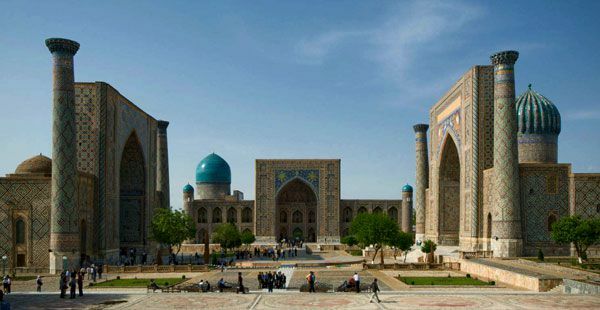 Here you will find three grand madrasahs (Muslim schools): the Ulugbek Madrasah, the Sher-Dor Madrasah, and the Tilya-Kori Madrasah (1646–1660). It was once the center of public activities – including royal proclamations and public executions. It was, for many centuries, the heart of the city. Today, it is one of Uzbekistan’s biggest crowd drawers. Entering Khiva is like stepping out of a time machine and stepping into a centuries-old Orient town devoid of modernized buildings and big trees. In fact, Khiva is one of Uzbekistan’s museum cities. Even today, in modern times, Khiva is still sprawling with citadels such as the Kunya Ark (meaning “old fortress”) and a palace called the Tash-Kauli. Like most Uzbek destinations, Khiva is also filled with imposing and intricate madrasahs, minarets and mosques. But what truly sets it apart from other Uzbek destinations is the intricacy of the wood carvings that you will find in the structures here. Beautiful patterns and complex designs are carved into doors and columns all over the palaces and buildings in Khiva. With Khiva’s magnificent architectural specimens, visitors are in for a visual feast as they walk on the city’s paved streets. If there’s something that Tashkent has a lot of, it’s mausoleums. One of these is the Kaldyrgach-bly Mausoleum, the oldest one in Tashkent. Others are the mausoleums of Abubakr Muhammad Kaffal Shashi, one of the world’s first imams, and the mausoleum of Zainuddin-bobo Sheikh, who is the son of the founded the Sufi order. Tashkent also has an old town filled with mosques, Asian bazaars and madrasahs. The old town’s winding streets, courtyards and ancient buildings are a must-see for anybody taking a trip to Uzbekistan.